Every so often I get asked ‘what is the latest hot app’ and after using DabbleDB I have a new answer to that question. 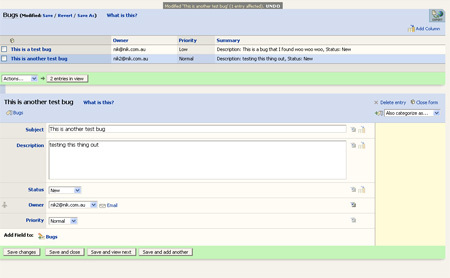 DabbleDB is a platform that allows you to create applications online using a web interface. The sort of applications you would create and then use are what most of us normally hack together in a spreadsheet or using some other database application that is often complex. Example applications that I created in DabbleDB are a contacts list, where I can store, share and categorise my contacts, and also an issue tracking system where I can track bugs and change requests. Other examples on the DabbleDB website are a expense report application, a conference organising app, a scheduling app and a client invoicing application. It took me 5 minutes to create each of the apps I built, the interface is intuitive and simple to use. Once I created an app I was able to invite other users in with varying levels of permissions (read, write or build) to then enter and/or modify data, or to further customise the app themselves. 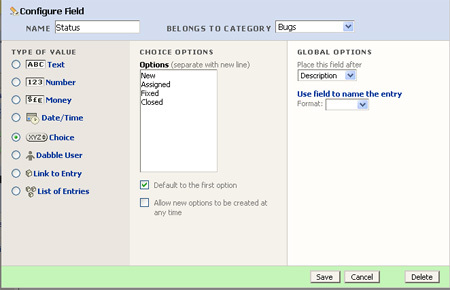 When creating the application, there are a number of default field types that I can choose from such as a textbox, calendar selection, URL, drop-down selection, a link to another user and many more. At no point did I have to think twice during the building process, I visualised in my head what I needed and a few minutes later it was there on the screen and I was adding entries to it. The app building process is perfect and could not be simpler, if I realise after adding a few entries that I need another field, I just click ‘add field’ and I quickly select what I want and it is there. When I look at all the spreadsheets that I have, I could throw all of them away except for my pure financial spreadsheets and have the rest of that information on DabbleDB within applications that I create myself. It would be a richer experience and give me more options, and I am then able to invite other people in to view this data as well as access it from anywhere. I don’t see the limit to the type of applications that can be built on DabbleDB, from complex project management applications through to the simplest contacts database. DabbleDB has been developed over the past 12 months by Andrew Catton and Avi Bryant who run an open source and Smalltalk consulting business in Vancouver, Canada (DabbleDB has been developed in Smalltalk using a database system they developed). They expect to be able to launch within a month and currently have thousands of beta users signed up and ready to go. User will be able to try out DabbleDB with a 30-day free trial, and after the trial you will need to pick an account plan which varies based on number of users, number of applications and number of records. Andrew and Avi expect pricing to possibly start at $10 a month or lower and go up beyond $100 per month for enterprises. Future plans include an Atom API, more rich views for data types (maps, gantt charts, and graphs) and custom forms that you can include on your own website where the information will feed back into your DabbleDB app. The upcoming plan which excited me was pre-built applications which users can install and customise themselves, giving them a start in using DabbleDB. DabbleDB has great technology, and certainly has a market for this service with not much competition for the type of users they are targeting (ie. People who hack what should be in a database into a spreadsheet) – I am going to build my 2 apps further and add some more and use it in the future to replace the dozens of spreadsheets I have that I can’t do a lot with. These guys have solved some complex problems in building this app and I am confident there will be many personal users as well as businesses who will find that this platform for custom apps will relieve a lot of the pain they have now with spreadsheets. If you would like more information about DabbleDB, then go and sign up for the beta on their homepage or checkout their blog.